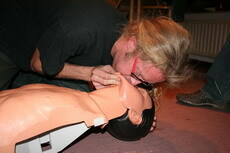 Last autumn we decided to do a first aid course with the group. The presence of a lot off snow and ice and the lack of roads on Greenland can slow down medical assistance drastically. Only Sanne already had a first aid diploma. So to be self sufficient in handling minor injuries and giving first aid on Greenland, the other expedition members decided to get their diploma as well. 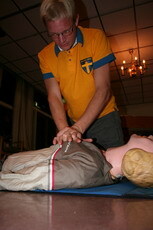 We followed the First Aid course in Utrecht. We found out at the start, that it was mainly important to know what not to do in case off an emergency. Just try to stabilize the situation and call for professional help. The evenings were always lively and we learned a lot. Off course we were interested in the treatment off cold injuries and hypothermia. And yes, there we also learned what not to do. Really: rubbing doesn't work!!! Don't do it because it is really not good!! During CPR-practice it became clear for everybody by who they wanted, or really not wanted to be reanimated. Especially with the help of a, to a computer connected, practicing doll. With some off us there is a big chance that during a session of chest compressions the victim will be pushed thru the icecap. Luckily Greenland has a thick ice layer. Everybody's armpits were being assessed on functionality as safe haven for first and second degree frostbite. In this way Pim's feet were saved by Sanne during our Norway trip. And in Greenland she off course can only be in one tent at the time. The coffee brakes were used for meetings about Greenland. After every course session we hung around outside in the cold to go on with the meeting and to brainstorm about the project. Luckily we all got the diploma though it was not easy to help our exam-victim. She had severe bleedings and it was hard to recognise she was going into a shock. But thanks to the exam we will never forget the signs of shock. Everybody learned a lot, so now Sanne can also feel safe.